Read more about how the University brings the collection of Seward family papers to life. 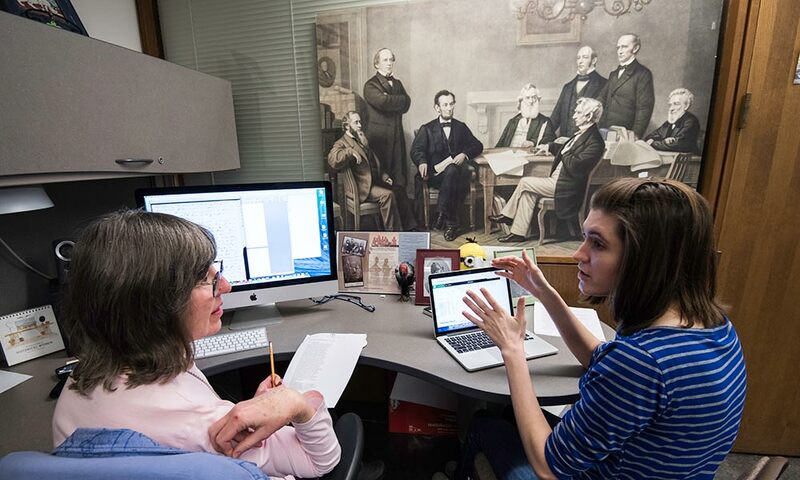 The Seward Family Digital Archive, a digital-humanities project that fuses object-based learning and community-engaged teaching, has received more than $1 million in external grant funding to date. The latest grant comes from the Robert David Lion Gardiner Foundation for $289,100 to be paid out over two years. The project, a collaboration between the University’s Department of History, the River Campus Libraries’ department of Rare Books, Special Collections, and Preservation, and the Digital Scholarship Lab, brings together students in the humanities and computer science, residents of retirement communities, and retired volunteers from the greater Rochester area to help transcribe the thousands of Seward family letters, all written in Victorian-era cursive handwriting. “Citizen archivists” is how Thomas Slaughter, the project’s principal investigator and the University’s Arthur R. Miller Professor of History, describes his team of students and retirees who transcribe, annotate, and tag personal letters of President Abraham Lincoln’s Secretary of State, William H. Seward, his wife, Frances Miller Seward, their immediate and extended family members, and friends from about 1820 to 1873. According to Slaughter the new funding will be used to expand the project’s geographical reach, while enhancing teaching and learning opportunities for students and volunteers. “The generous new grant from the Gardiner Foundation will enable students to train and support additional volunteers beyond the 20 now working with us, to enhance this community-engaged collaboration, and to increase the productivity of the project while maintaining the high standards for documentary editing set by the National Historical Publications and Records Commission, which supports the volunteer arm of the project through December 2018,” says Slaughter. Besides continuing the collaborating with volunteers from the Highlands at Pittsford retirement community, the Penfield Recreation’s DEAR program, and retired University staff and librarians, the effort will soon include another off-campus site for volunteers in Brockport who’ll be working alongside Slaughter’s students. In addition, a student videographer will be trained to make short films about how to collaborate on public history projects. “The addition of a videographer under the Gardiner Foundation grant will allow us to visualize our training and project standards available on our website for others just starting public-history collaborations between college students and volunteers,” Slaughter says. The archive project was launched and has been sustained over the last five years through the support of the Fred L. Emerson Foundation, which helped secure additional grants from the National Historical Publications and Records Commission (NHPRC), and most recently the Gardiner Foundation. Seward, who lived from 1801 to 1872, was a trial attorney, a New York state senator (1831–1838), governor of New York (1838–1842), U.S. senator (1849–1860), and secretary of state (1860–1869). He was the frontrunner for the Republican nomination for president in 1860, only to be sidelined in favor of someone more moderate in his support of abolition: Abraham Lincoln. Seward is arguably best remembered for his decision to purchase Alaska—at the time, called “Seward’s Folly.” He was also attacked in the assassination plot that killed Lincoln. The collection of papers, both professional and personal, includes 230 linear feet of materials, 150,000 items, and 375,000 pages. RBSCP has been the repository of the Seward papers since 1951.